For those in the construction industry, renting a self-storage unit is a simple, sensible solution for storing that extra material or equipment. It is all too common for painters, electricians, and plumbers to work out of their vans or trucks without a proper place to store their tools, equipment, and materials. It is commonplace for successful contractors to use self-storage units to store such items to help keep overhead low. 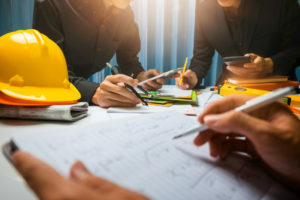 Still, some contractors opt to store their tools, material, and equipment on-site, which can lead to disaster as this exposes these items to theft, vandalism, and weather damage. Choosing a centrally-located storage unit, close to the building site or project location, helps mitigate these risks while also helping to make transportation of equipment, tools, and material much easier. Contractor storage saves our customers money because there are no upfront capital expenses and all utilities (including heat, electric, and wi-fi) are included. Typical leases at competing facilities force customers to sign binding agreements for five years – and utilities must be paid separately to boot! With no long-term contracts to worry about, contractor storage units from STORExpress can save hardworking construction workers the money they need to get the job done on a budget. STORExpress self-storage facilities that offer contractor storage (Turtle Creek, Etna, and McKees Rocks) offer wide aisles and drive-up storage units to enable quick loading times for equipment, tools, and materials. Accessibility is critical – if a storage unit is inaccessible it will cost the contractor valuable time and energy. Luckily for contractors who work with STORExpress, they have the option at each of our three contractor storage facilities to utilize drive-up accessible storage units. Loading docks are available for some units making accessibility even easier for larger items. Convenience is another amenity worth seeking out – no contractor wants lost time on the job. Computerized gate access allows all different types of contractors, from electricians to plumbers, to pick up tools early in the morning before the workday starts on the job site. For even added convenience, some storage facilities accept deliveries of building materials, allowing contractors to continue working. It is a great feeling to be able to continue working – not having to worry and wait for the supplies to be delivered off-site. A few basic tool storage tips can help keep construction equipment and tools in good working condition. Store small contractor tools in plastic bins inside a self-storage unit – the plastic bins will help protect the tools from dirt, dust and other impediments that may cause damage. The real beauty of plastic bins is that they are both easy to stack and easy to transport, not to mention the organization benefit they provide! Label the boxes appropriately so that you and your team can find tools quickly and easily when you need to. STORExpress offers a wide variety of contractor storage solutions at three of our Pittsburgh-area locations – Turtle Creek, Etna, McKees Rocks. Whether the job is big or small, we have a self-storage solution that is just right for you. Larger units are perfect for material and equipment storage while small units work well for tools. If you are a contractor, it is time to declutter that work van! Call or stop by to learn how STORExpress can help you store those extra tools, that extra equipment or material today.